The Conqueror Lifestyle is a Christian lifestyle that evidences the Power of the hand of God at work in you. I hope that you will come to realize that you want to develop and maintain this lifestyle today. Whether you are Christian or non-Christian, get acquainted with the dynamics of this powerful, spiritual experience available to you. In my book “A Conqueror In Training” you will come to know the origins of the structured training God allowed me to experience through hard trials, persecution, tribulation and sin-sickness. The book exposes the tremendous odds I was able to beat through the Christ in me. Ultimately, God was ordaining me to be available to help you realize how to develop and maintain the Conqueror Lifestyle in your life through our Lord and Savior Jesus Christ. You too can beat the odds against you spiritually no matter how you have come to know the struggles of spiritual warfare. 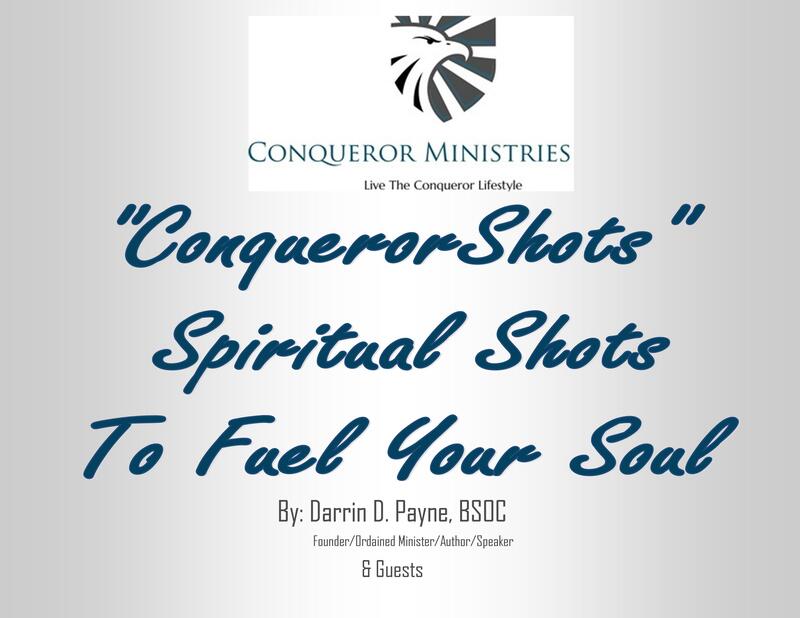 ConquerorShots are always available to give you foundational truth that God has freely exposed me to during the years of additional training and development in His Word. Through our Heavenly Father, and your continued support, I am grateful to have developed additional materials which will become available to you and offer you additional, personal assistance in developing and maintaining the Conqueror Lifestyle. God has equipped me to help you through Conqueror Books and Conqueror Outreach. You will come to know the power of God’s Mighty hand at work in you more and more. Let’s be all that God has created us to be. Live the Conqueror Lifestyle. To get more free information about the Conqueror Lifestyle click here.